A commercial driver’s license or CDL in Ohio requires several tests as well as the submission of documents which will provide for your identification and background. It is important to get this license if you are contemplating about working as a truck driver both intra and interstate. The US government had issued recent rules that are provided to ensure a much safer experience for truck drivers and in order to maintain the integrity of national security. If you want to acquire the license, you will have to go through several steps which may take several months to finish. The first thing that you must possess in order to get a CDL in Ohio is the proper age. You should be at least 18 years old if you want to drive trucks intrastate and 21 years old if you will be driving interstate. If you are within this age limit then you can apply for a license. Aside from this, you will also need to study the Ohio CDL Manual which contains all the necessary information with regards to truck driving. It discusses road signs and rules, parts and proper maintenance of trucks, road trip planning, truck driving in different conditions, and the areas where you will be tested on during the road test. To apply for the CDL, you will need to submit several documents first: your current driver’s license, your social security card and number, valid ID, birth certificate, proof of legal residence in the United States, and a filled out application form. You must have a clean driving record as the BMV will conduct a background check on your driver’s license and you must not have been convicted of any serious crimes or traffic violations for the past two years. Your license must not have suspended or revoked for any reason at all immediately preceding your application. After submitting these requirements, you will need to undergo a DOT medical certification and a visual exam. You have to pass both of these tests in order to proceed to your application. The DOT certification must be done by a DOT accredited medical professional and the visual exam must be passed with a visual acuity of 20/40. After this, you will be given a written exam which shall consist of some basic ideas about driving and road signs. Make sure that you secure a schedule first before heading to the driver licensing office. If you pass the written test, you will then be provided with a temporary permit which will allow you to drive a truck as long as you are with a licensed individual. Make sure that you learn everything that you need to know about actual driving during this period and then take the road test before your permit expires. 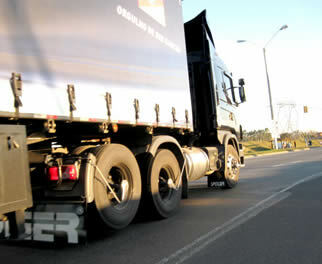 The road test involves three different areas – pre-trip inspection, basic driving skills, and road test. You will be tested on your efficiency in handling these several areas and if you successfully pass all of them, you will be provided with a CDL in Ohio. Visit this page to discover the available truck driving schools in OH if you need training behind the whell and assistance with passing the state license exams. for further information about license requirements you can read the OH commercial driver’s manual shared below.